Examples of economic incentives include low interest loans, grants, and water rates and rate structures. 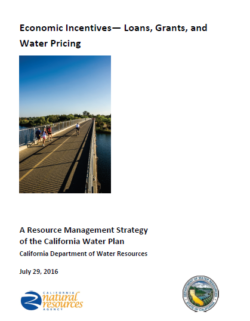 Free services, rebates, and the use of tax revenues to partially fund water services also have a direct effect on the prices paid by water users. Government financial assistance can provide incentives for integrated resource plans by regional and local agencies. Also, government financial assistance can help water suppliers make incentives available to their water users for a specific purpose. 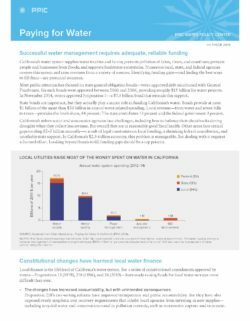 Assistance programs can also help align the economic and financial drivers affecting local, regional, and statewide water management decisions to minimize unintended consequences and maximize the benefits of working cooperatively with consistent goals and objectives. As opposed to incentives, penalties are a type of economic disincentive that can be used to discourage undesirable water use behavior. Incentives can be created or enhanced by facilitating water market transfers, by creating market opportunities where they did not exist, by expanding opportunities where they currently exist, or by reducing market transaction costs. 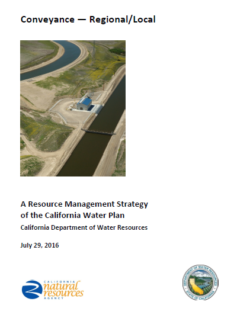 In each case, new or enhanced market opportunities can influence water management decisions. 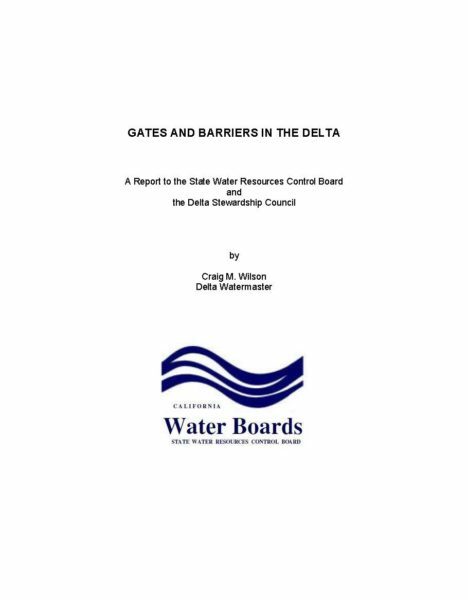 While previous Delta Watermaster reports have dealt mainly with water rights and water supply issues, Water Code section 85230 (d) specifies that reports shall also be submitted on water quality issues and conveyance operations. The use of barriers and gates in the Delta addresses both of these topics. 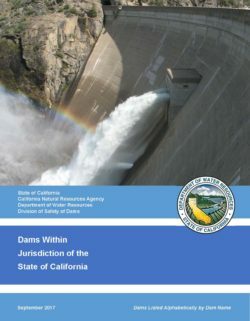 The Oroville Dam spillway incident was caused by a long-term systemic failure of the California Department of Water Resources (DWR), regulatory, and general industry practices to recognize and address inherent spillway design and construction weaknesses, poor bedrock quality, and deteriorated service spillway chute conditions. The incident cannot reasonably be “blamed” mainly on any one individual, group, or organization. During service spillway operation on February 7, 2017, water injection through both cracks and joints in the chute slab resulted in uplift forces beneath the slab that exceeded the uplift capacity and structural strength of the slab, at a location along the steep section of the chute . The uplifted slab section exposed the underlying poor quality foundation rock at that location to unexpected severe erosion, resulting in removal of additional slab sections and more erosion . 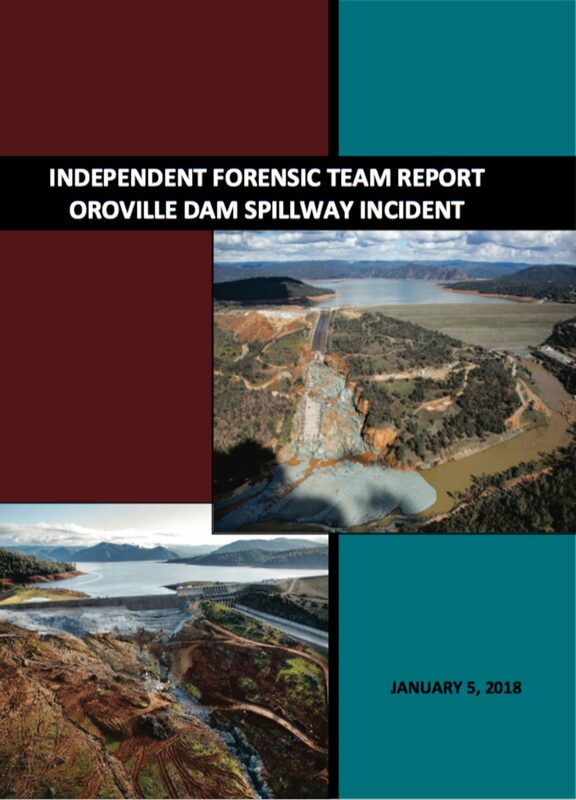 Responding to the damage to the service spillway chute necessitated difficult risk tradeoffs while the lake continued to rise. The resulting decisions, made without a full understanding of relative uncertainties and consequences, allowed the reservoir level to rise above the emergency spillway weir for the first time in the project’s history, leading to severe and rapid erosion downstream of the weir and, ultimately, the evacuation order.
. . . There were many opportunities to intervene and prevent the incident , but the overall system of interconnected factors operated in a way that these opportunities were missed. Numerous human , organizational, and industry factors led to the physical factors not being recognized and properly addressed, and to the decision-making during the incident. 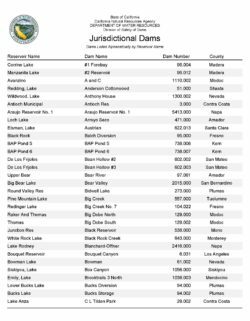 The 770-square-mile Smith River Basin and Plain in the northwestern corner of California has adequate water supplies overall, but a problem exists in distributing the water to the areas of use. 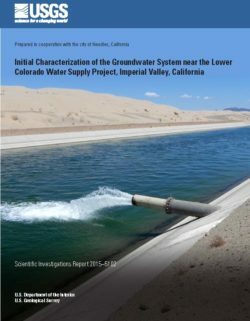 The present water needs are now met, and can probably continue to be met, from groundwater pumping and direct diversion of unregulated streamflow. The Bertsch Tract and surrounding area near Crescent City has experienced serious groundwater problems such as low well yields, high iron content, bad taste, and sewage contamination. Existing and proposed subdivision development around Lakes Earl and Talawa could eventually pose a water quality threat to the lakes and ground water if individual septic systems are used for sewage disposal. The Smith River Basin, including Lakes Earl and Talawa, is subject to periodic flooding which does considerable damage to roads, bridges, and agricultural land. Urban encroachment onto floodplain lands would increase the damages of these floods tremendously. A large part of the study area's projected water demand will come from areas near Crescent City that could be served by the Crescent City system. The Department of Water Resources recommends that Del Norte County encourage the extension of Crescent City water service to such areas, including the Bertsch Tract. 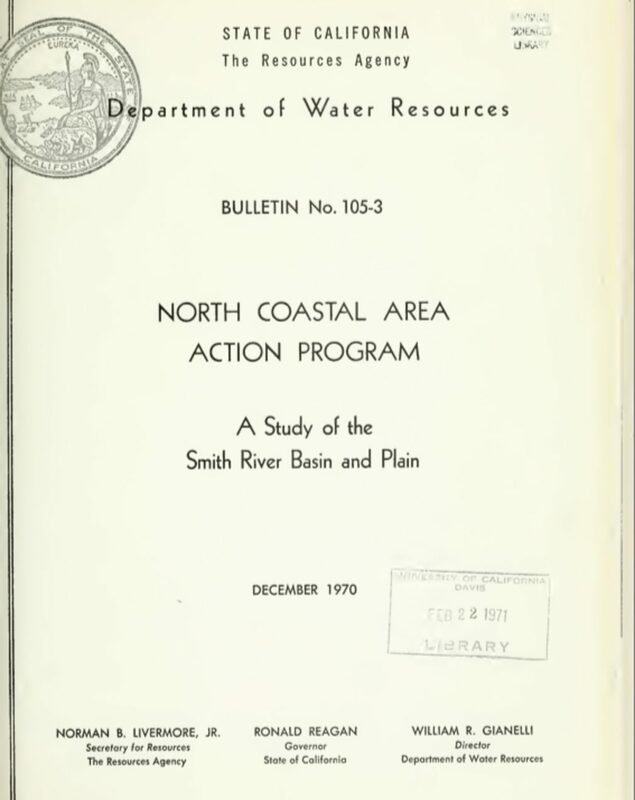 The Department further recommends that the water in Lakes Earl and Talawa be tested periodically to determine if pollution from septic systems is reaching the lakes, that a floodplain management program be developed for the Smith River, that adequate water well construction and sealing standards be adopted and enforced, and that all levels of government make a concerted effort to preserve the outstanding natural beauty and aesthetic character of the Smith River Basin.